We are excited to host our Study Abroad Fair on Tuesday, September 18th from 10am – 2pm in the Student Center Ballroom on the Atlanta campus! You'll be able to explore all the study abroad programs available to you as a GSU student, as well as programs offered outside of GSU. 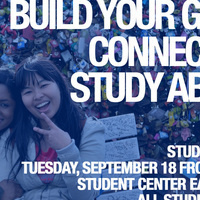 Recently returned study abroad students will be on hand to share their experiences, plus you'll have the opportunity to learn about study abroad scholarships and speak to study abroad advisors. We hope to see you there!